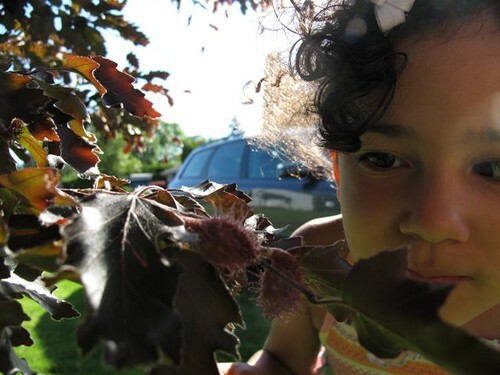 Off topic, but last night over dinner my niece Olivia (above, examining a copper beech I was taking a picture of last summer) had some charming observations. She has been learning about Martin Luther King Jr in her 1st grade class. The teacher omitted his death from the story, but Olivia sensed there was something important missing, so she looked it up herself. Olivia has a white mother, black father, and she has, as far as I can tell, come up with her own original term: she has always described herself as syrupy. When she was relaying the story of MLK Jr’s end, she told us he really got shot, but he died working for syrupy people like her. I love that she was able to make all the abstract connections necessary to understand that this wasn’t only a history lesson, it had a real impact on her life today, and she had a genuine appreciation for the work he did for the world. Too stinking cute and a smarty pants too, she’s going to go far! And not that it has anything to do with anything but I have always loved the name Olivia. So pretty and classy. Don’t children always come up with the “just right” word? What a doll. Your niece is beautiful, inside and out. Thank you for relating this lovely story. PS I can tell her auntie Megan is already setting her on the path to plant love! Out of the mouths of babes. Syrupy indeed. What a cutie. She looked it up herself? In first grade? Olivia is one sharp cookie…and a syrupy cookie…sounds delish. Bless her heart.